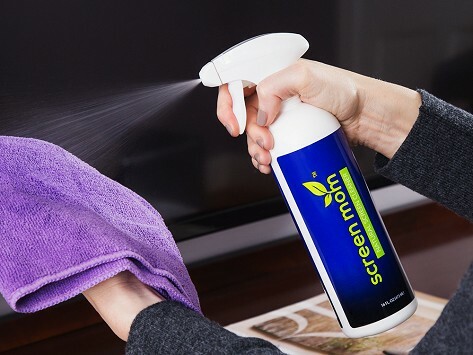 Tackle smudges, dirt, fingerprints, and dust with a screen cleaner made to do the job in a more natural way. The plant-based formula is free from ammonia, alcohol, and phosphates, and it won’t leave streaks in its wake as it cleans TVs, tablets, phones, laptops, and even glasses. Made in the USA. Dimensions: 7.8" x 2.5" x 2.5"
Product is easy to work and it leaves screens smudge free. I used this Screen Mom spray o n my phone and t.vs etcIt worked exactly as claimed..Perfect.. Does everything it says, plus leaves screens really shiny,real easy to use. This DIY mom enlisted her engineer husband to help create a plant-based formula to do the grime-removing job on screens in a kid- and pet-friendlier way. There’s no odor and there also isn’t any ammonia, alcohol, or phosphates in it, either. This more natural approach to cleaning up is one we appreciated when we tried it out and we especially liked that while the cleaner removed dust and dirt from our devices, it didn’t leave any streaks in its wake.